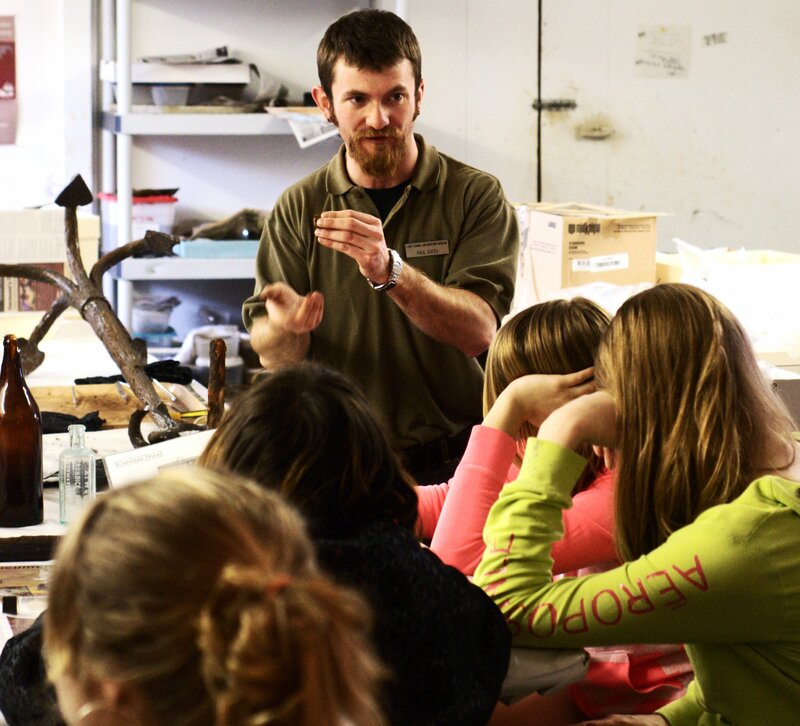 On April 11, students from Mount Abraham Union High School visited the Conservation Lab, eager to learn about the wonders of preservation. As part of our mission here at LCMM we strive to educate the public about the importance of protecting our invaluable cultural resources. Lake Champlain is a non-salt water environment that is cold, dark, and has an anaerobic mud layer. These qualities make it ideal for conserving all sorts of artifact material types, everything from wood, metals, glass, ceramics, and even organics. Once these resources are removed they immediately start to degrade. Valuable contextual information is inevitably lost when this happens. In this dynamic world, cultural resources are in constant danger to being destroyed, lost, or stolen. Archaeologists at LCMM serve as stewards for the protection and preservation of these amazing artifacts. By examining, recovering, and conserving the artifacts contained within the lake we are effectively fulfilling our goals. In doing this, we are able to present history in an exciting and awe-inspiring way. It gives me a sense of honor, pride, and dare I say…makes me giddy to know that young adults like these have a vested interest in the archaeological world. I cannot stress how important our collective history is. I also want to highlight the need to spread awareness for it. If you didn’t have the amount of enthusiasm that you showed me when you came here, then who knows what the fate of our past maybe. So I tip my hat to you and wish you well, the world and our future needs more folks like yourselves! Paul grew up in Boise, ID and came to Vermont in 2003 for his undergrad degree in History and a minor in Archaeology with a focus on Medieval society and culture at UVM. 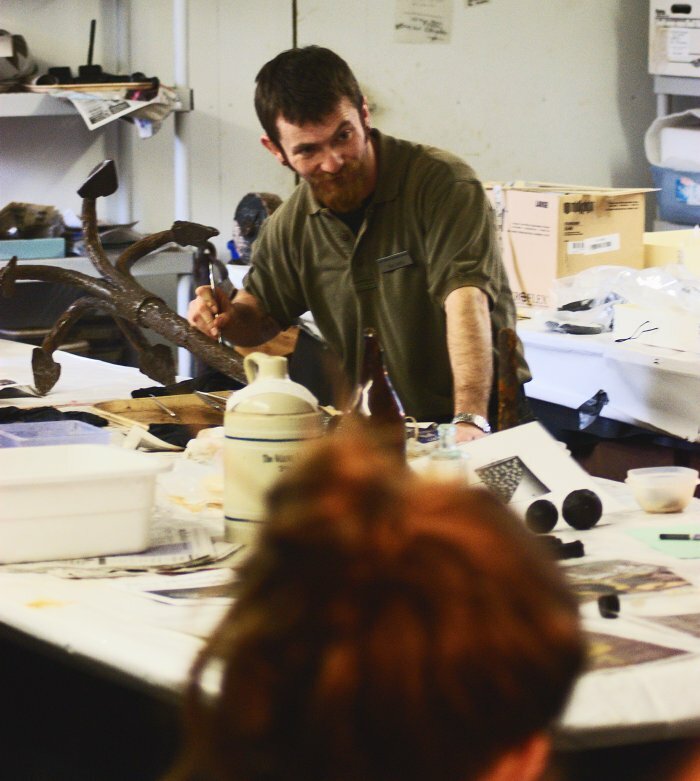 He started volunteering at LCMM in winter of 2008 as a Collections Management intern and then did intern work in the Conservation lab. He joined the ranks of the paid staff in the winter of 2010. He is currently the Assistant Chief for Charlotte Volunteer Rescue Squad and serves as a Board Member for the 1675 Foundation.